Below is the text from the local news - HTS website about the forthcoming severe weather alert. The Met Services Director is urging yachtsmen and small craft operators to keep away from the sea from Wednesday. Thomas Auguste says a low pressure system located over the Northern Atlantic will generate heavy swells. 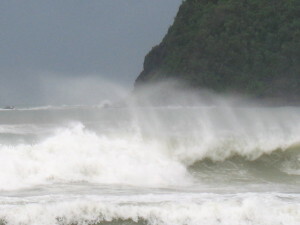 It is expected to affect St. Lucia directly from Thursday, through the Easter weekend. The Chief Fisheries Officer is also calling on local fishermen to heed the warning from the Met Office. Vaughn Charles says fishers should take precaution to ensure there is no loss of life. 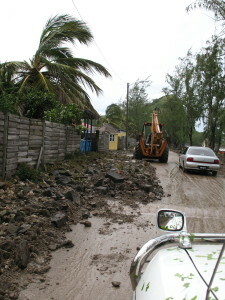 Residents of coastal communities are especially at risk. 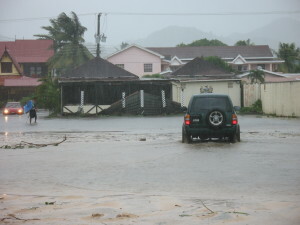 Auguste says residents should remain cautious and follow guidelines set out by the Met and Emergency Services. Authorities are advising strongly that yachts and small craft should not to go out to sea on Wednesday March 19, as there is a significant risk that conditions at the entrance to all bays will prevent a safe return. There are no evacuation plans for residents in low lying areas. Auguste says this is not a tropical system and it is expected to diminish after its passage through the Caribbean. It happened about 3pm this afternoon and it was definitely the most powerful and longest earthquake that I had ever felt and everyone is saying the same thing. There was also a weaker and shorter one yesterday about 10:15am and a 5.6 magnitude on the morning of September 13th. All of these earthquakes have their epicenters located around Martinique. We need to find out what is the cause of this because we live in a volcanic region. 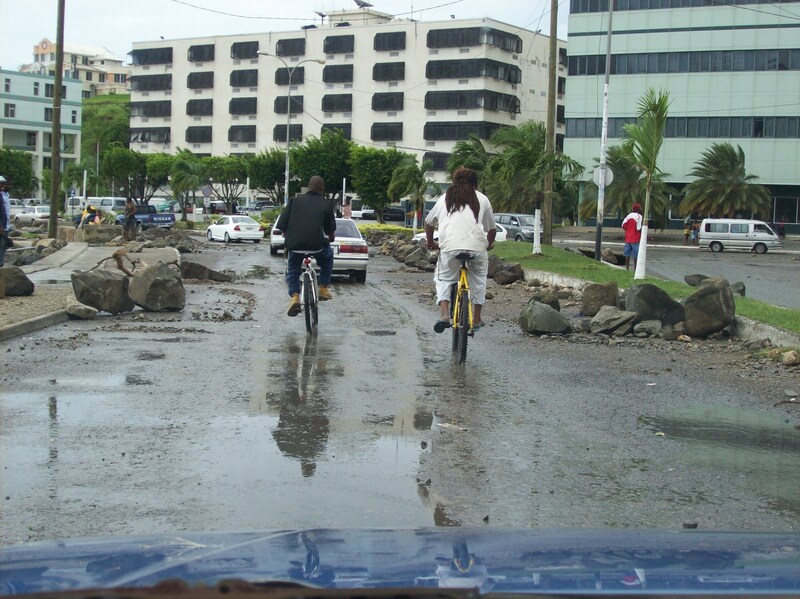 There was total chaos in Castries this afternoon as people ran outside of shops and offices causing traffic jams. In spite of the violent earthquake, i'm even more shocked, and thankful, that there was not more damage. 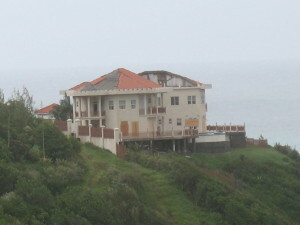 Some buildings have been damaged in Martinique though. I hope there were no serious injuries as a result of this event. This is Chef Bobo reporting from St Lucia. Yes, we had a very strong tremble today. I was shopping just when the quake started. It was a long quake, 30-40 seconds and items were falling off the shelves in the supermarket. (that's when I was running out on the street my self!!) 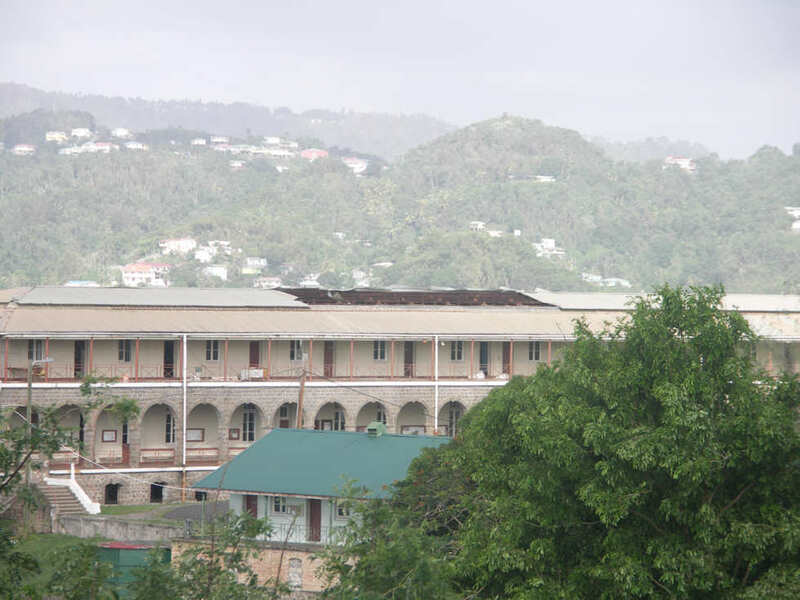 Some buildings in central Castries got cracks and reports say that specifically Chireki Building got a good bit of cracks. No reports of fallen buildings or poles. All telephone and electricity is working just fine. We all got really scared but it is calm and under control. I wrote to you a day or two ago moaning about the weather, but am just wondering if eartyhquakes constitute 'weather'? Reason ? 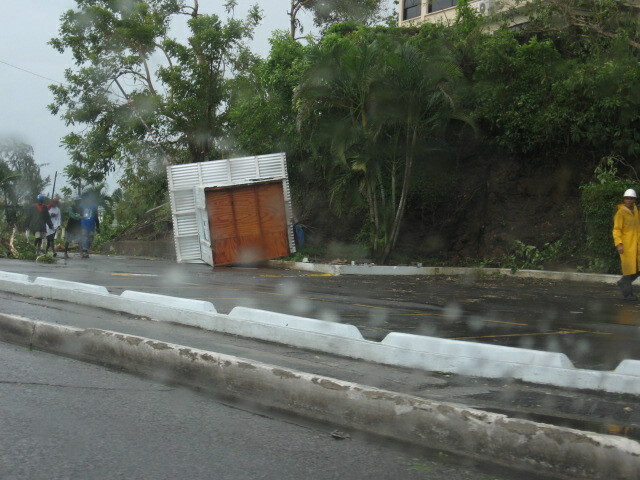 We just had a reallly BIG one up here in the North of St./ Lucia. It lasted several minutes and along with newly installed guests from Barbados, our cat and me were going loopy!! The last time I personally experienced such a hefty shuddering was on Christmas Day 1969 ... I think. That one found me on top of the Morne at a party and nobody said anything as we all thought we had over imbibed!!! Back to the plot. Today's quake managed to dislodge boxes of food etc., and pans from kitchen shelves. As a 'by the way', today's weather has been idyllic! The computer turned itself off in protest! 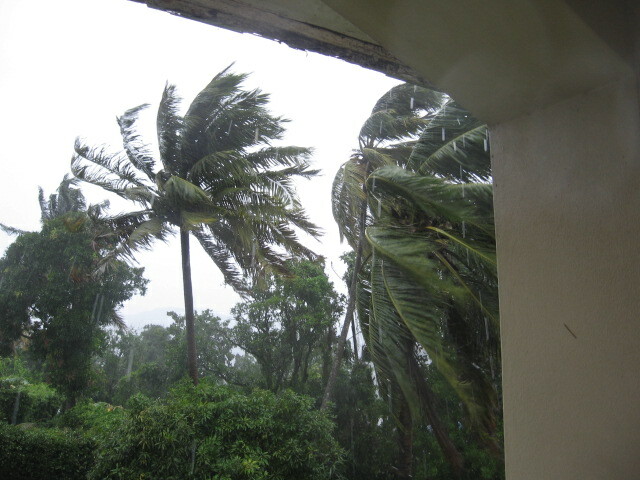 Yesterday came as a reminder that we need not only look out for the winds but also the rains. I was in the south of the island and it was uncomforably hot (a/c weather), but the northern side was singing a different tune. High ground!!!! 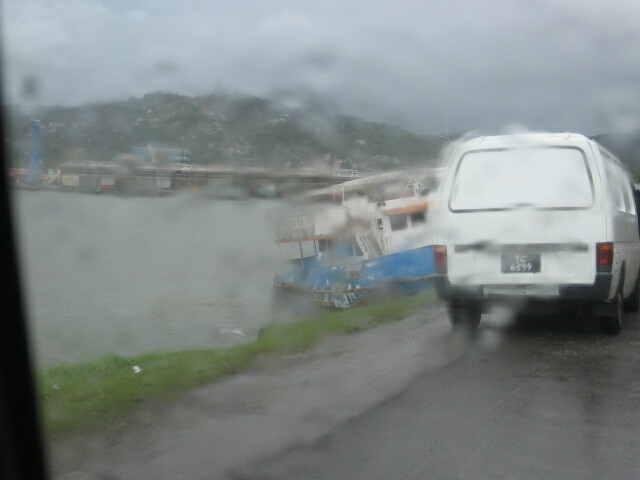 The Castries River almost and at some points did overflow its banks causing serious traffic disruptions. 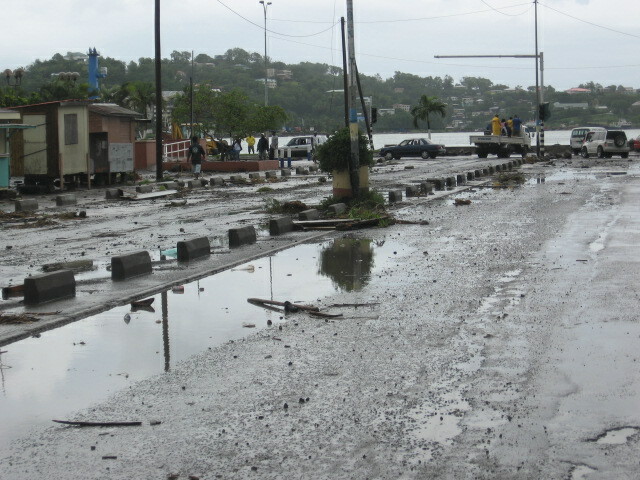 The city of Castries was almost entirely under water, Gablewoods Shooping Mall was seriously flooded and there were several mudslides in various areas. 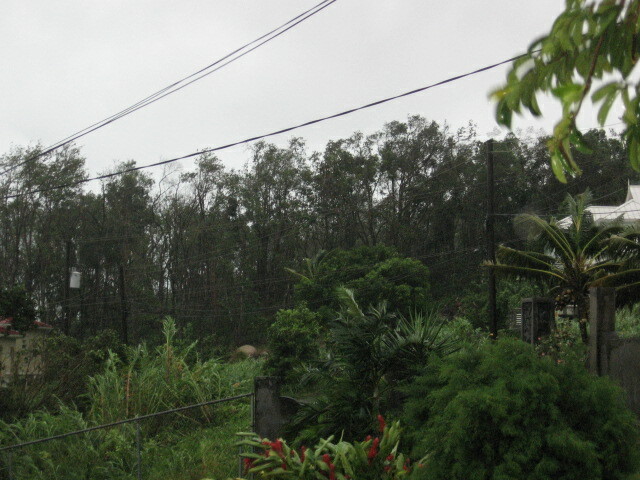 While cleanups are still underway, I see the sky is very dark and cloudy this smorning. Waiting to see what happens. For whatever reason, I woke up at some time in the early hours of this morning to see my bedroom flashed into light by some lightening and heard the rain pattering down on the roof. It's still raining now (a good few hours later) and doesn't look as though it's going to stop for a while yet. At least it's cooled the atmosphere down abit. The remnants of Ingrid weakened today but are starting to re-fire some thunderstorms tonight. 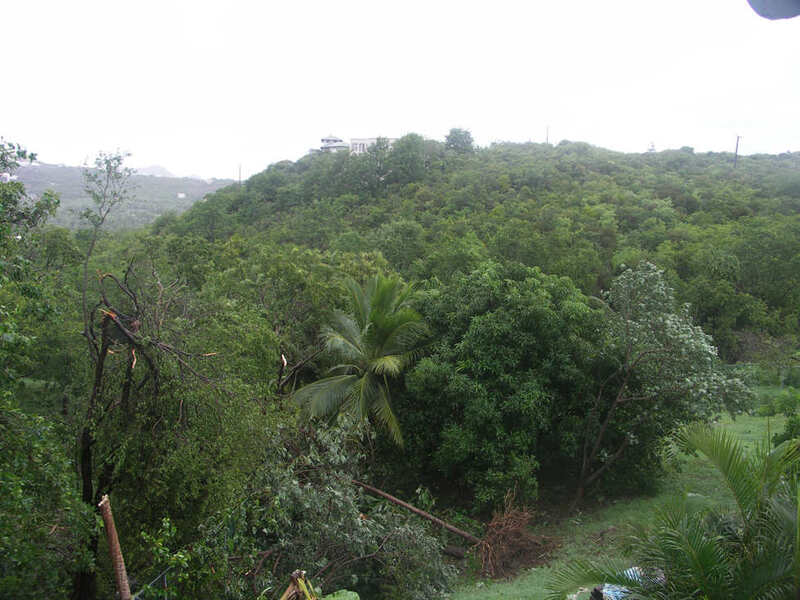 The thunderstorms which have developed all the way near Dominica and Guadeloupe are so strong, that frequent flashes of lightning are lighting up the sky all the way in St. Lucia!! So imagine what those folks are experiencing in the islands further north. Looks like some heavy rain could affect the Leeward and northern Windward Islands tonight. 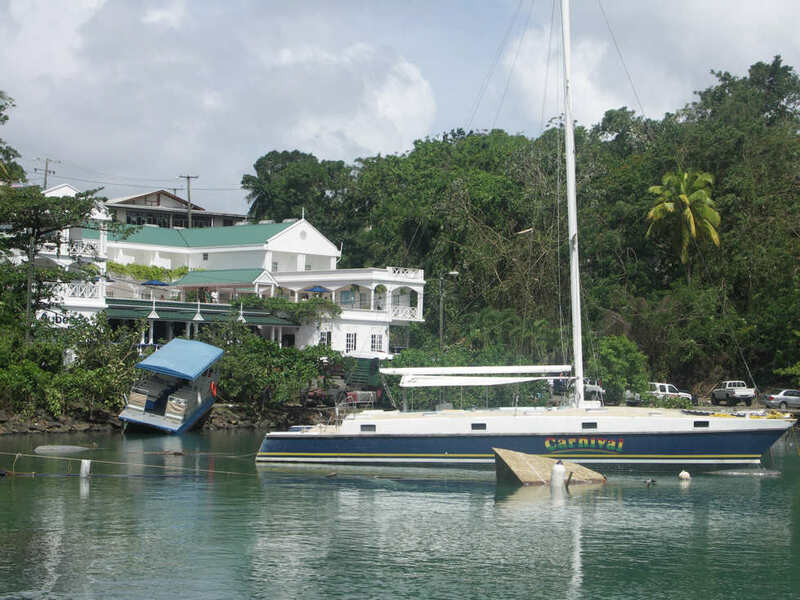 - Strong earthquake rocks St. Lucia. I know this is not "weather" related but it is still a very dangerous natural hazard. Shortly before 2:40am this morning, a heavy earthquake rocked the island. This is a strongest one i've felt in probably 15 years. There's no damage to the house but this earthquake was strong to cause my brothers to jump from their sleep. If anything serious happened around the island, I will report about it. According to the USGS website, the epicenter was only 40 miles ENE of Castries, St. Lucia and 45 miles ESE of Fort-De-France, Martinique. The magnitude was 5.1 which is pretty strong. Thankfully, the epicenter was at sea and not on land. I am sitting by my desk with the never-ending paper work hearing the wind howl outside and flowerpots shifting around on the balcony. We had some heavy showers in the afternoon but after that it has only been strong gusty winds. 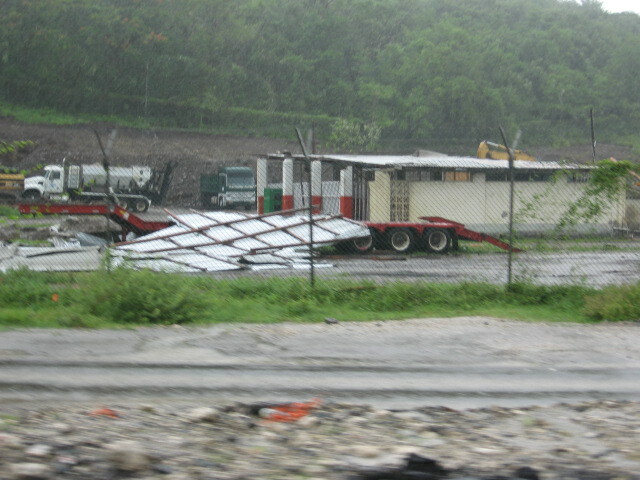 I was stunned to read Mike's post about the roof on Castries Health Centre and the damaged vehicles. I guess it reminds us that it does not have to be a hurricane to cause severe damage. Let us hope everyone stay safe in the path of this one, whatever it will become, and following ones. I also want to express my sincere thanks for all the emails and positive support I received after my debut post on stormcarib.com following Dean. I was in fact quite overwhelmed by all the kind words. Thank you. Please be advised that The Edge Restaurant, Bar & Sushi will be closed for the month of September 2007. We are sorry for any inconvenience caused. We will be open again as usual, daily for Breakfast, Lunch and Dinner, from 1 October 2007. 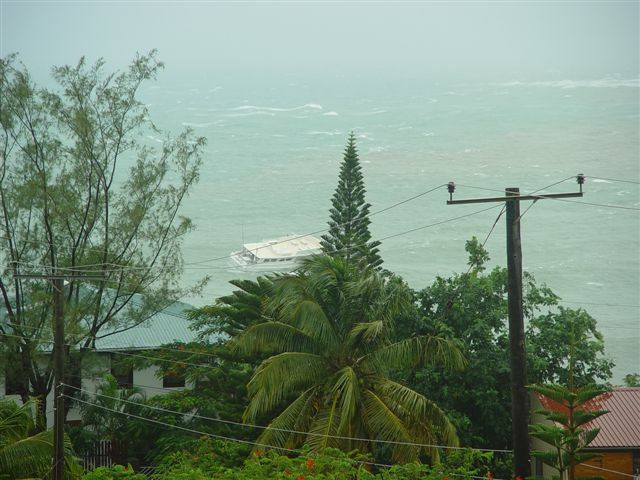 TD #6 has only just started affecting St. Lucia but it has already inflicted some damage. 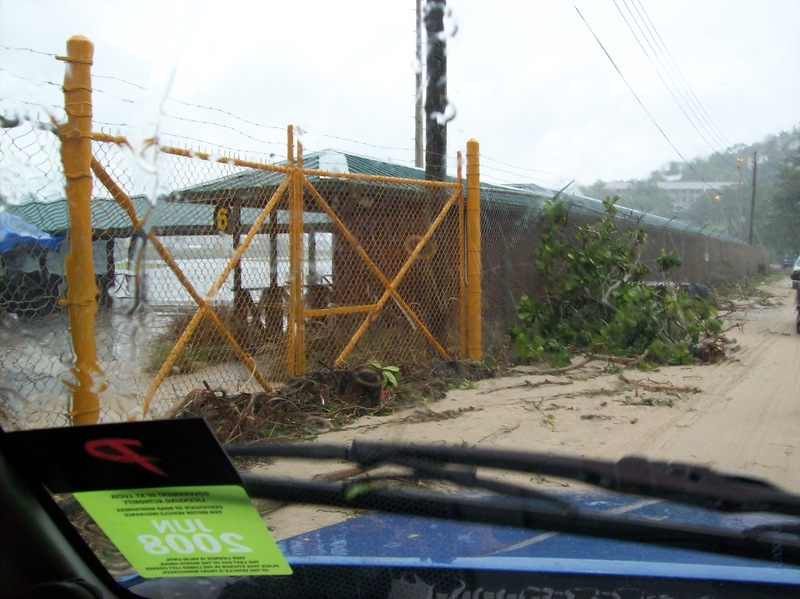 As the outer bands began to spread over the island, heavy showers, thunderstorms and strong gusty winds resulted in the roof of the Castries Health Centre being blown off and damaging as many as 12 vehicles which were parked in the parking lot. That's not a good sign for tonight. Lets hope that our neighbours in the islands further south take this one seriously and prepare for the system properly in spite of the very short notice of it's arrival. We did not have it real bad on the south end of the island. A few roofs off, some lean-to's down, streets covered with debris but nothing real serious. 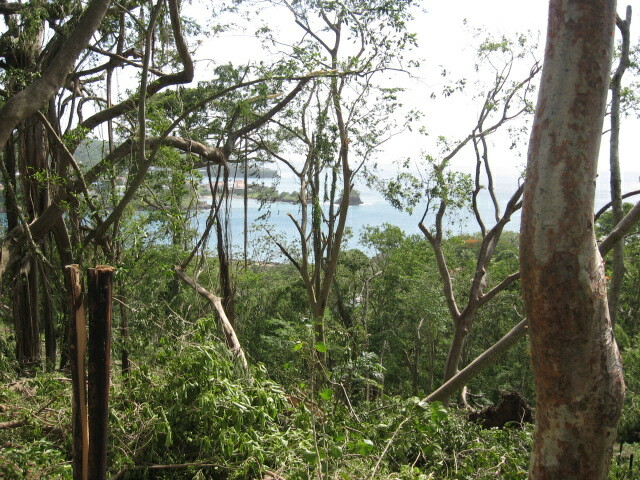 We did loose a lot of banana trees as did the whole island. 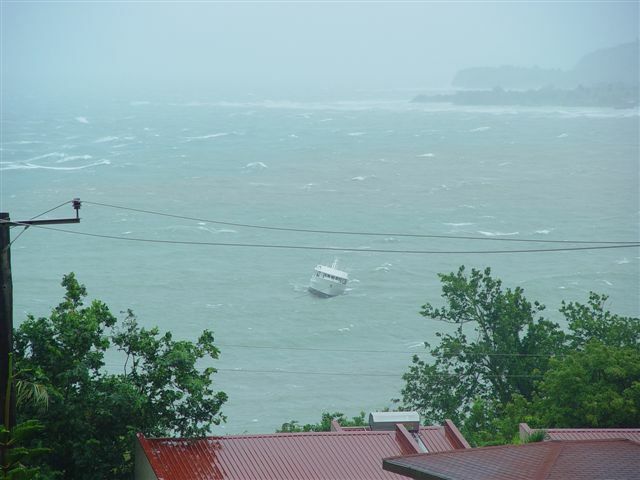 Our strong winds and heavy rains seem to come and go. We also had a lot of lightning and thunder. Our power went out Friday morning, came back on for a few hours and then off again until in the evening. Have sent a few pictures. 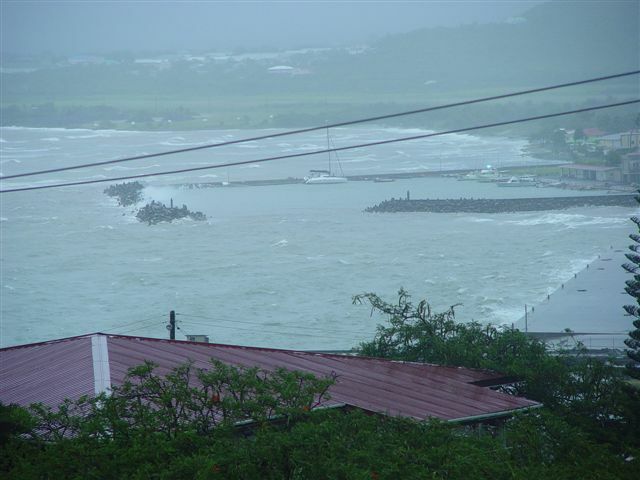 We are close to the bay in Vieux Fort Harbor and watched an 80' boat being tossed around for many hours. Our prayers were with her captain as he had a very rough night and morning. He did a great job though. 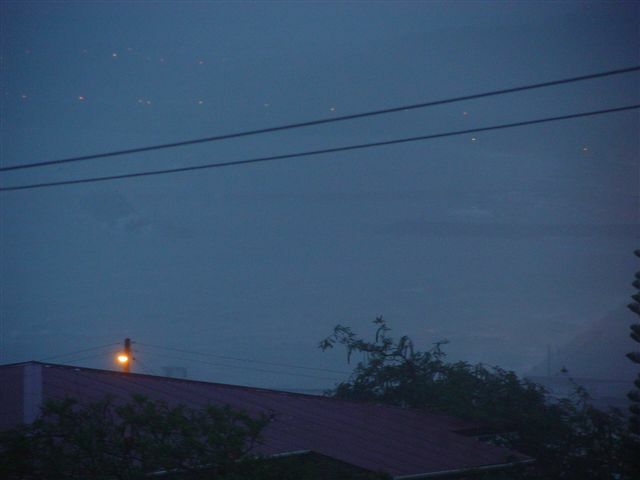 Most of our pictures are of the boat and the harbor in Vieux Fort, St. Lucia. I’ve been thinking about the experiences that Dean thrust upon us and I have come away thinking that in a way this is just what we needed. 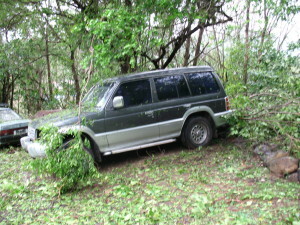 A brush with what could have been a very serious hurricane yet we suffered what I consider to be fairly minor damage. Just enough to really see the power behind a major storm. There are too many people that have not had the experience of a hurricane as Allen out last major hurricane was 27 years ago. That means that everyone under the age of around 32 that has lived only in St. Lucia for all of their lives have never seen anything like this. I remember Allen very well and the damage to the island was staggering, Ivan in Grenada was just as powerful but went over a more densely populated area compared to the passage of the eye of Allen which skirted the south end of St. Lucia. 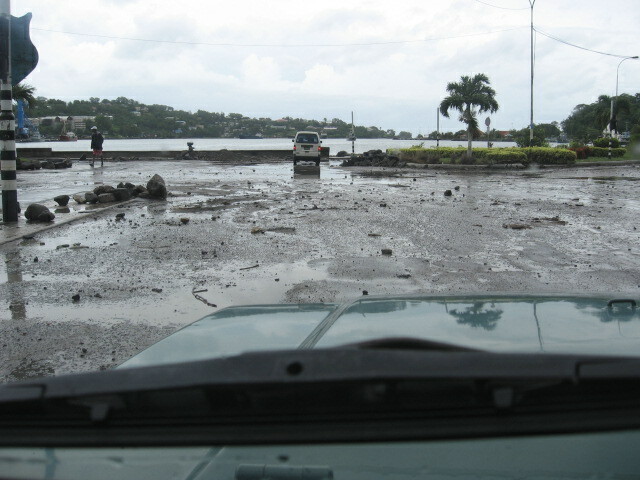 Castries was spared but the destruction was none the less incredible. Even though I should know better I still was un prepared and I have seen the weaknesses in my house and surroundings. Hopefully I will be better prepared for another hurricane, but please not again this season at least! What is really interesting are the views that have been opened up due to the destruction of the foliage, for the better in many cases I might add. Something that is probably needed every ten years or so to keep the foliage under some kind of control. 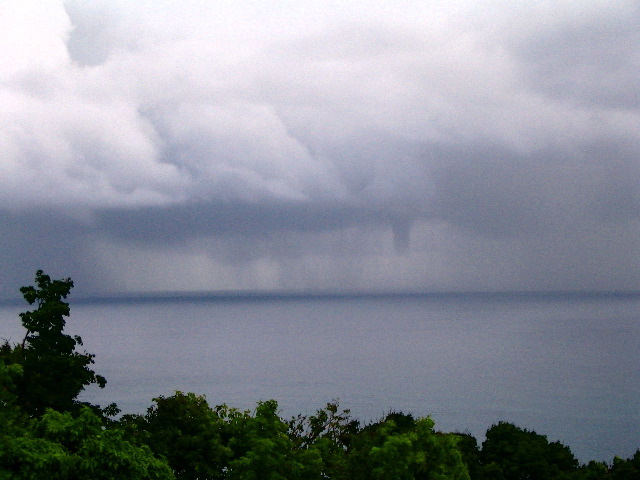 I have attached a few pictures, three from my father who lives at La Toc where he shot the pics of the huge seas and the water spout that developed on Sunday. I took a couple of pictures of my garden on Friday morning and some at the Vigie Marina, I have some video of the storm from my balcony and driving around the north end of the island that I will post when I can edit it. Thanks to all that have sent me e-mails, please accept my apologies if I have not responded to you. Finally got a chance to upload some photos of the morning after Dean from the cam. channel, so the sea was bad indeed. All in all St Lucia pulled through very well considering all. 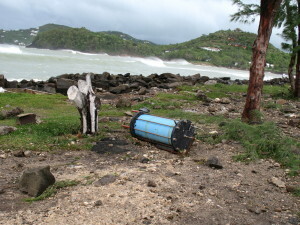 The 1st picture shows the tower carrying Radio St. Lucia's antenna bent and battered by Dean. The radio station is still off the air. 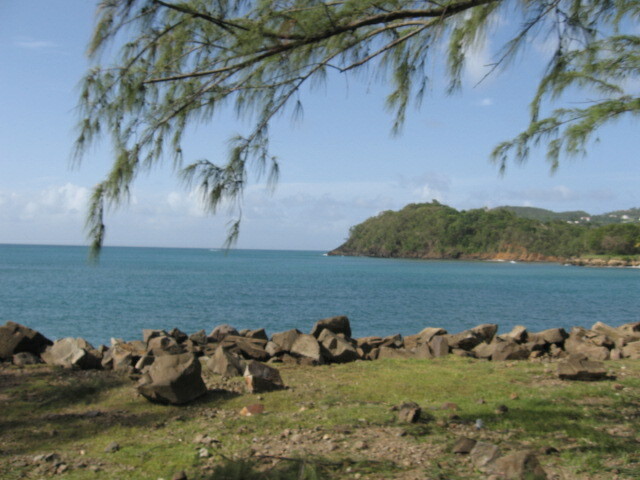 The next picture shows the view from Pigeon Point looking northwards towards Martinique. 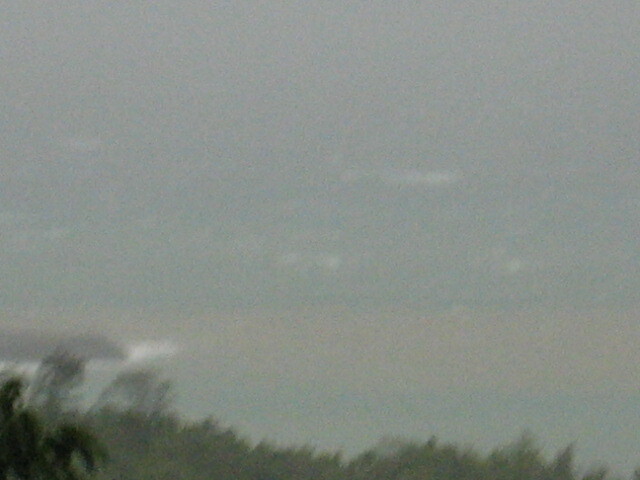 The body of water you are seeing is the St. Lucia Channel. Exactly where the eye of Hurricane Dean pass by about 6 am on Friday morning. It looks so calm and tranquil now that it's hard to believe that the eye of a category 2 hurricane passed there less that 48 hours ago. Make every IM count. Download Windows Live Messenger and join the i'm Initiative now. It's free. Make it count! 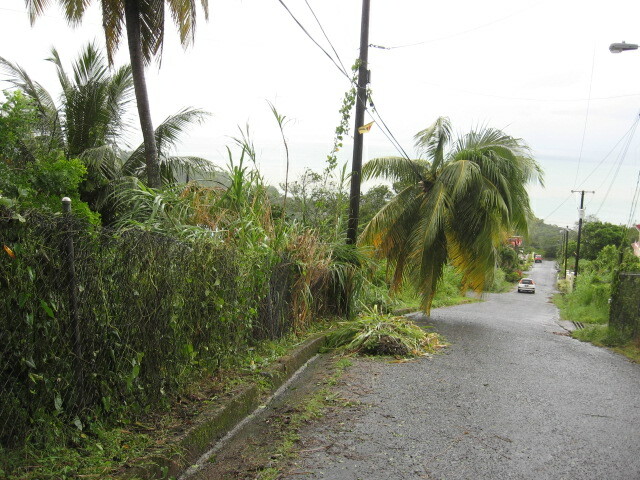 The northernmost part of St Lucia seems to have been brushed by the eye of Dean and in the area of Cap Estate we have seen some houses with partly lost roofs and quite a few fallen trees, branches and power lines partly blocking the roads (most of it cleared up by now). 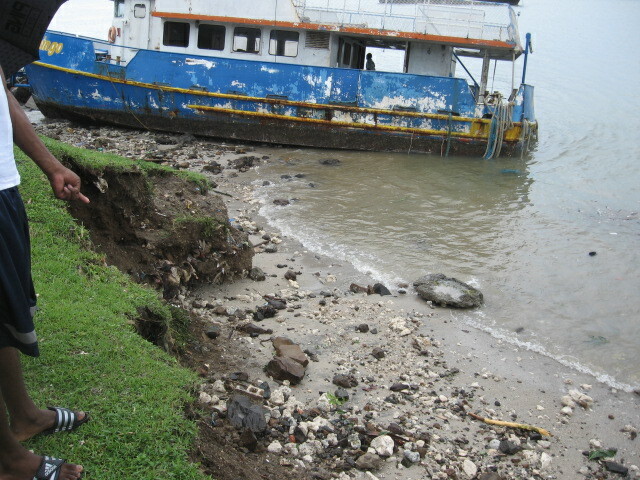 In this part of the island most houses are big and well built so the damage does not seem bad at all. 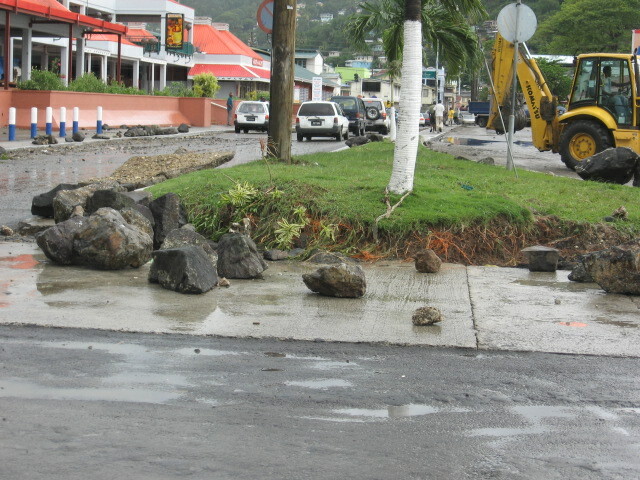 Pigeon Island and Pigeon Causeway seem to have been affected by huge storm surges so a lot of stones including small boulders and corals, sand and debris has been washed up against Sandals Grande. The wooden fence outside the hotel seem to have stopped it to go further into the property. 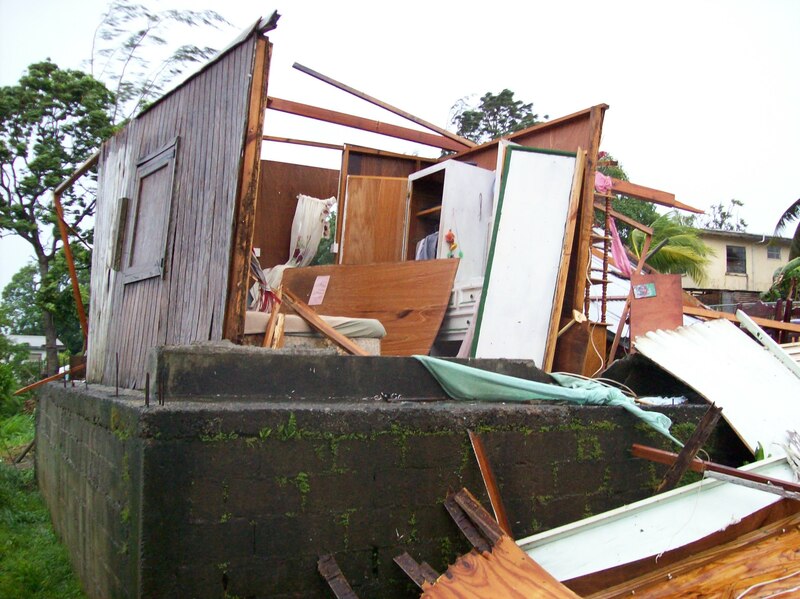 In the town of Gros Islet some houses lost their roofs including the Bar/Restaurant Banana Split. 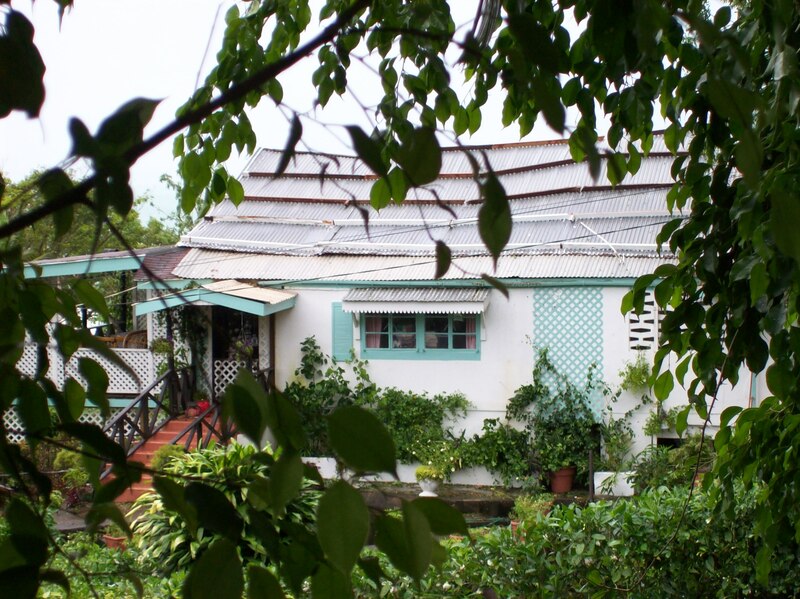 Here the houses are smaller, many only built of plywood and most of them with galvanized roofs. 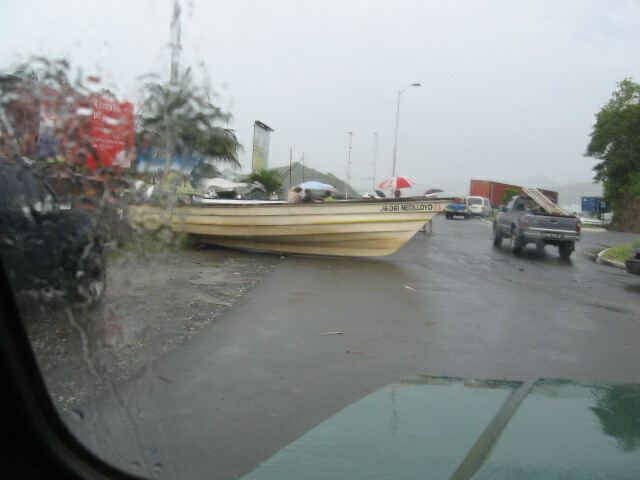 About six fishing boats are missing from Gros Islet and a few others have washed ashore broken in pieces. 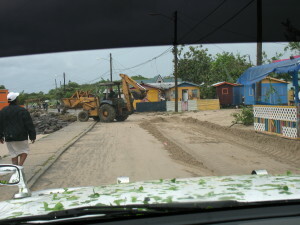 The storm surge seem to have been big here too with a lot of sand washing ashore. 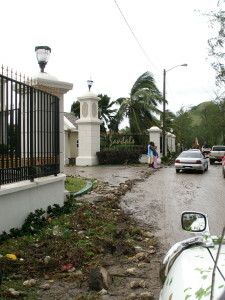 At Reduit Beach huge storm surges caused flooding to some of the hotels as far in as Tuxedo Villas on the other side of the road. 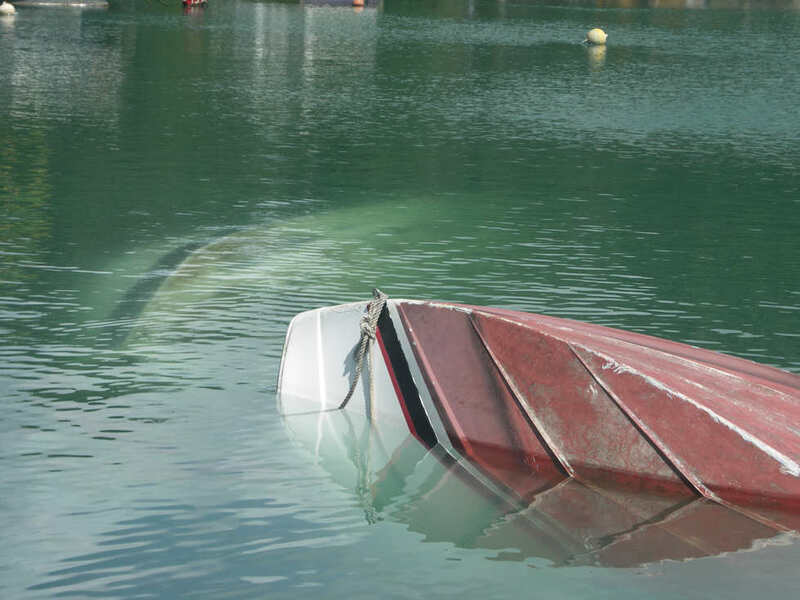 The yard behind The Yacht Club was completely flooded when we went by yesterday, a sail boat on stands had tipped over and part of the roof had come of the recently closed pub "Cat's Whiskers". 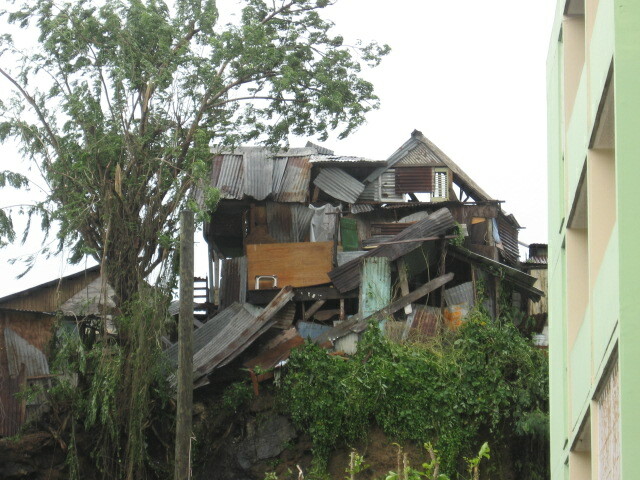 In Rodney Bay and Heights the houses are bigger and well built and as far as I know did not sustained any severe damage. We live on the hill in Reduit and the only thing that came down here was a huge amount of leaves and some small branches. I guess we were well protected by the smaller trees and bushes around and the hill behind us. 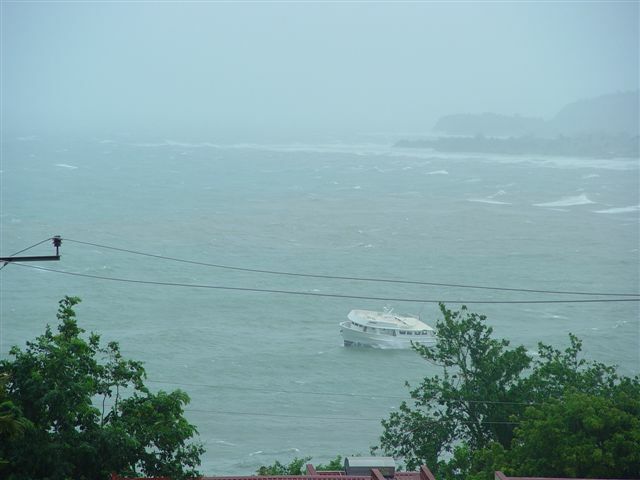 I have heard that some boats have sunk in Castries harbour and sand and stones has been washed up on our seaside Vigie airport but it is worse than everything is running as normal today. 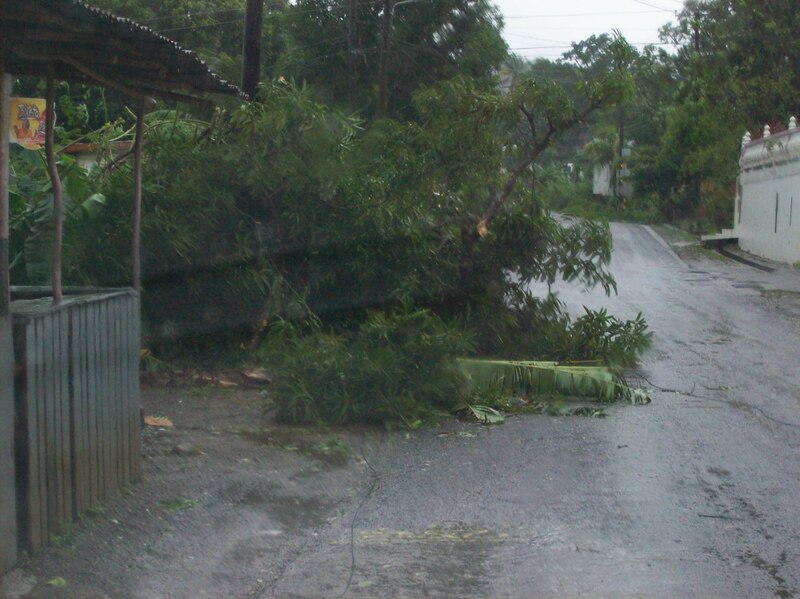 In other parts including the countryside in different parts of of the island I do not know much more than reports have been made of many fallen trees, some over houses, and overflowing of rivers. As far as I know only one fatality related to Dean is reported; a man somewhere in the countryside drowned when attempting to save a cow caught in an overflowing river. 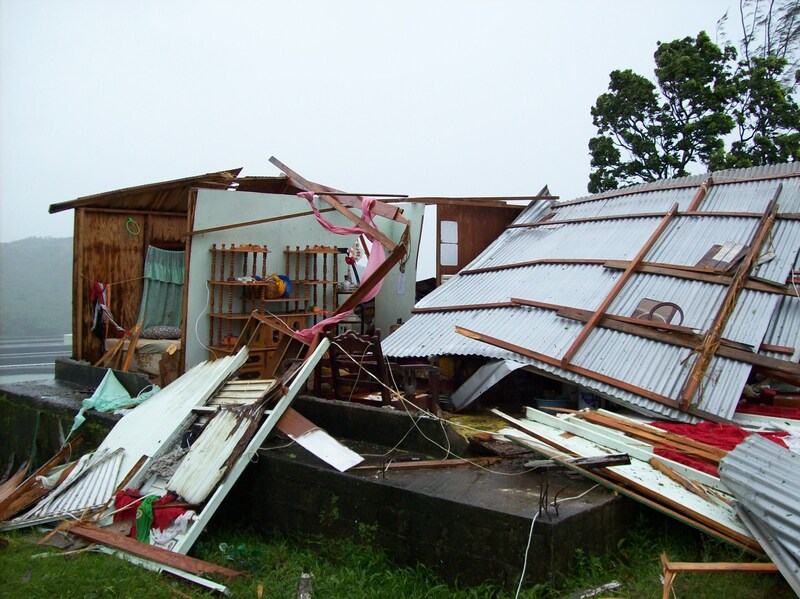 Many communities especially in the country side have a lot of small houses built with plywood houses and galvanized roofs and of course they have sustained more damages like blown off roofs and so forth but all in all it seems like mostly trees, branches and other debris have gone down. 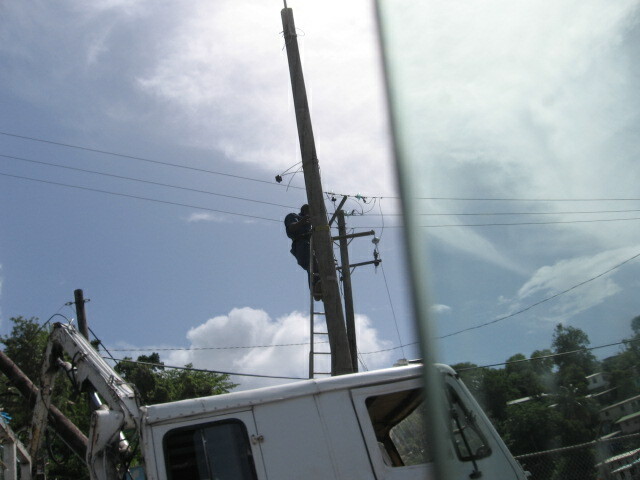 We also saw some electricity and telephone lines down when we were out a few hours after but we had telephone service all through the storm and the electricity came back Friday night in the areas around Rodney Heights and Reduit but did not return to Rodney Bay Village until late night Friday - early morning Saturday. 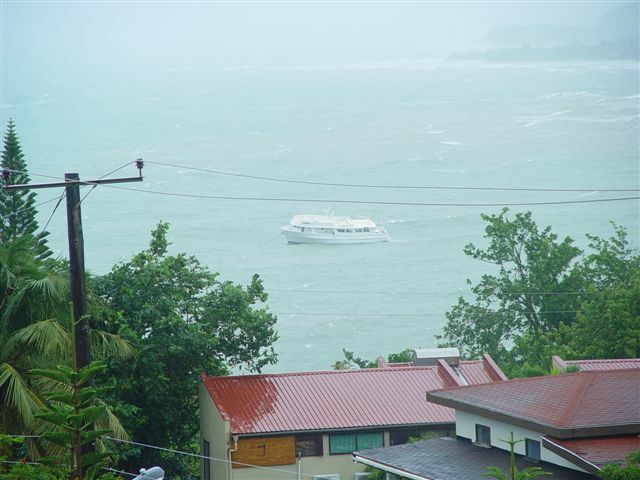 Our restaurant The Edge Restaurant, Bar and Sushi in Rodney Bay Village did not sustain any severe damage. Only a lot of leaves and dirt to clean up. A big motor yacht had dragged on its mooring and knocked down a few pieces of our railing and torches but from tonight Saturday we are open as usual, as most other business here in the north. We had quite a lot of rain and thunderstorms until around 8 pm last night but today it has been sunny and dry and we are all busy cleaning up. That is what I know so far but will try to give another update if I come to know more. We keep our fingers crossed that everyone in Dean's path will do alright and can only be lucky we are located in the beginning of the Caribbean sea as Dean probably will go to history as a VERY severe hurricane on its way over warmer waters. It's now warm, a bit windy, and doesn't seem as though the past 24 hours have happened. Things seem back to normal. Cars zooming past on the road, birds chirruping their songs. 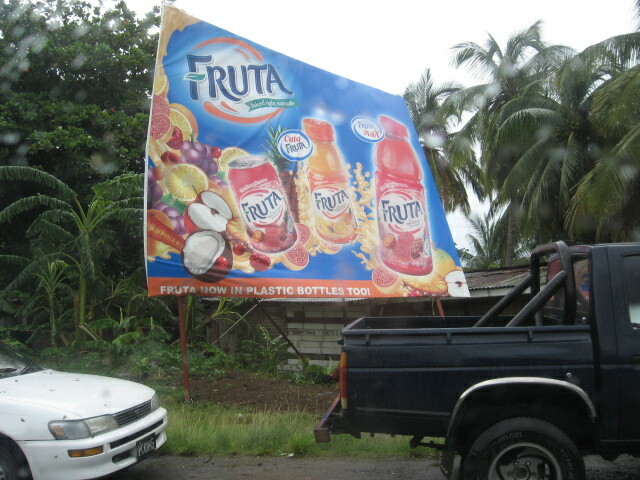 I took a drive from Choiseul to Soufriere to see what happened down in the south of the island. You can see the pics at the link below. 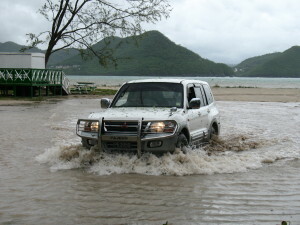 We always check out stormcarib.com this time of the year and find it great and very helpful to us in the islands. 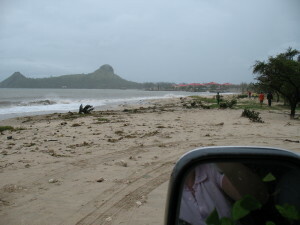 Please find attached some pictures taken in the northernmost part of St Lucia (Rodney Bay, Pigeon Island and Cap Estate) a few hours after Hurricane Dean passed . Feel free to post them at your site. 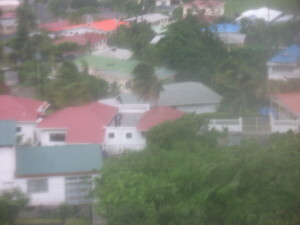 This pictures were taken mainly around the Castries area. 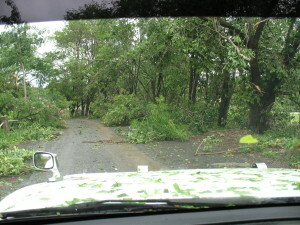 The conditions at times were too dangerous to go to other places to get more pictures. 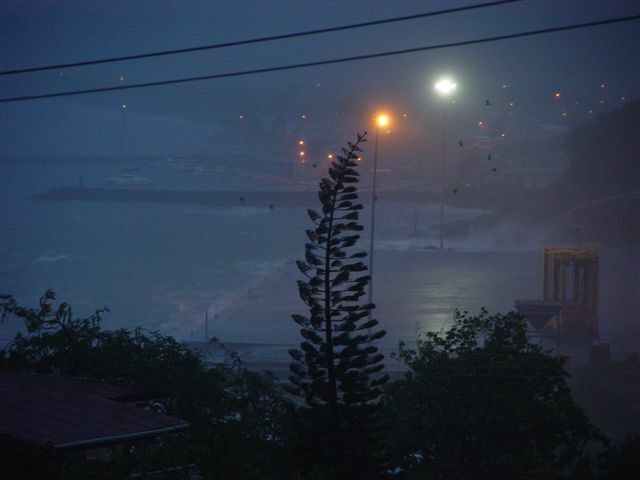 - Dangerous Dean: The most powerful hurricane to strike St. Lucia in 27 years. 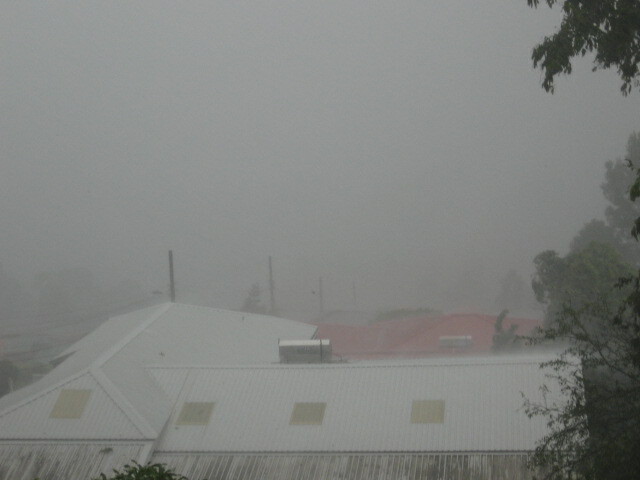 Early this morning Hurricane Dean tore through St. Lucia with violent winds and rains. 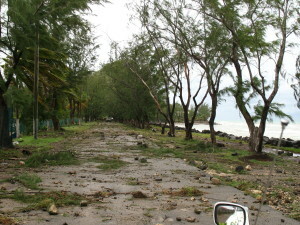 The southern portion of the eyewall brushed the northern part of the island resulting in very notable damage in certain parts of the country. 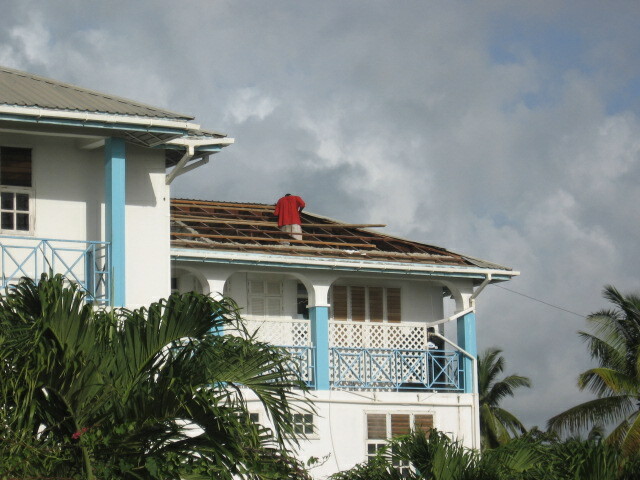 Several reports indicate that many roofs in the northern part of the island were blown off and a few homes were completely destroyed. 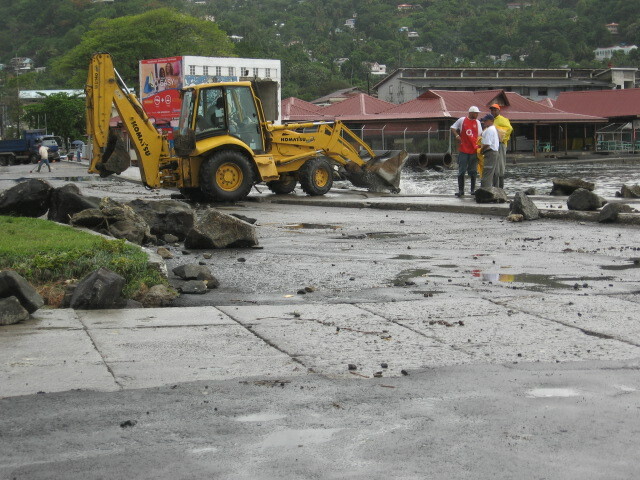 The roof of the Children’s Ward at the Victoria Hospital was blown off as well as that of a few schools and churches. 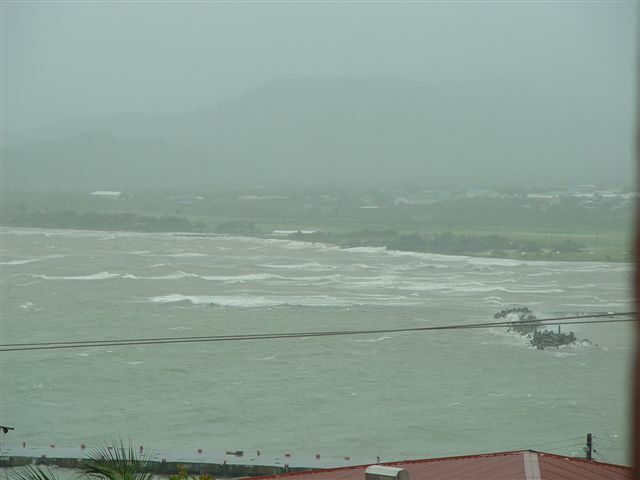 There were reports of flooding caused by heavy rains and also by the storm surge. 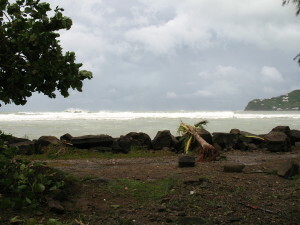 The waterfront area of the city of Castries was littered with debris as the large waves deposited the large boulders which were used along the shore to serve as a protective barrier against high seas right onto the street. 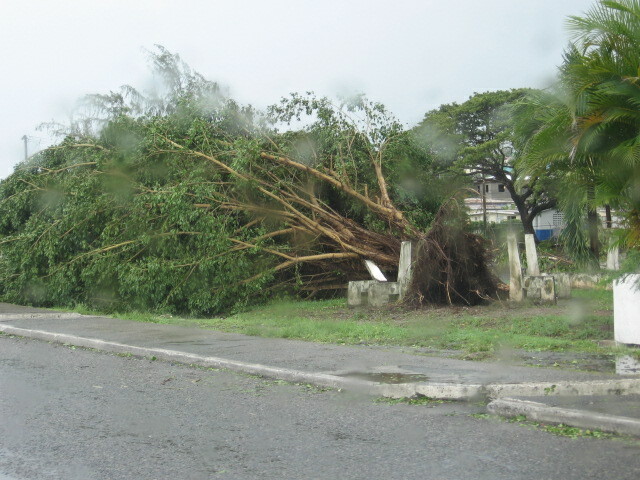 Numerous road signs and billboards were blown down. 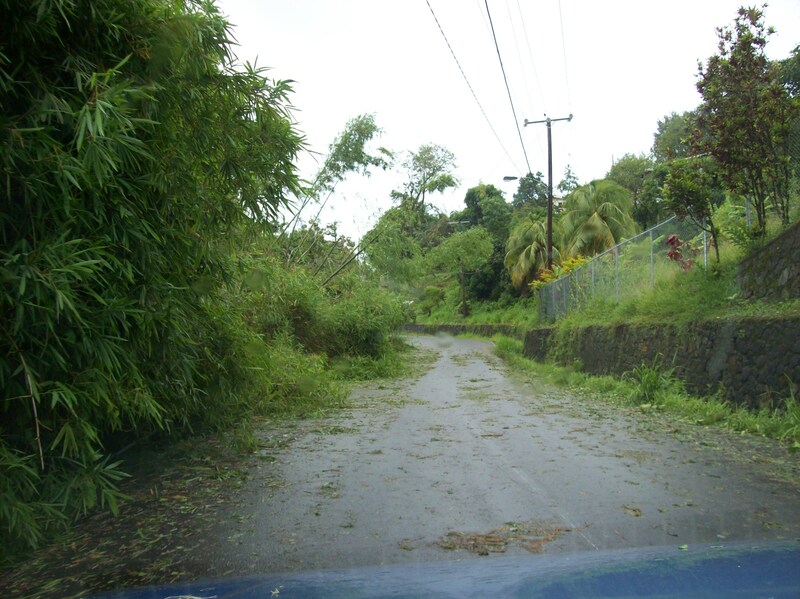 There was an islandwide power failure from about 4am this morning leaving over 165 000 persons with no power. 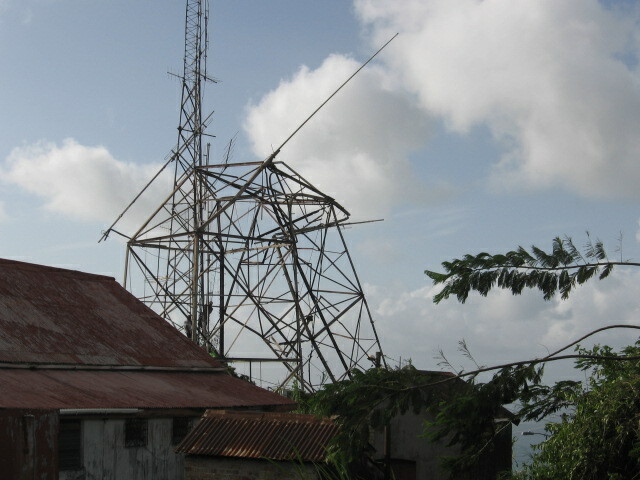 Most of the radio stations were knocked out during the cyclone and the tower holding the antennae of Radio St. Lucia which is located at Morne Fortune was almost completely destroyed. 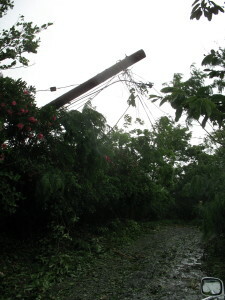 Several power lines were ripped off and some poles were toppled over as trees fell onto the lines. There has also been one fatality as a 62 yr old man drowned in Sarot. 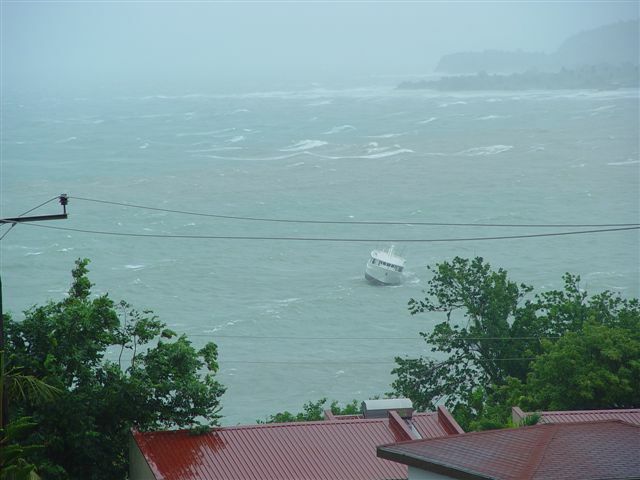 The heavy storm surge has caused some beach erosion and several boats have been reported to have sank. 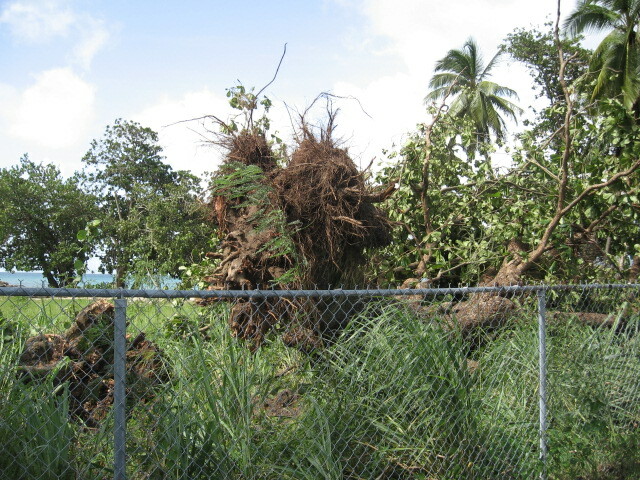 However, the most severe damage was caused to the vegetation with many, many trees uprooted and stripped bare of their leaves and branches. Everywhere is just littered with leaves and broken branches to the magnitude that I have never witnessed and similar sentiments are being shared by most people. 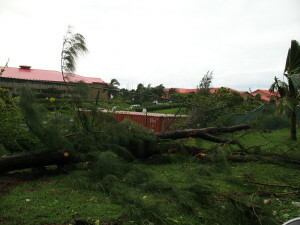 All of this destruction and possibly more, was all caused by the powerful winds generated by Dean which began to gusts violently from about 2am this morning and worsened between 4:30am and 7am this morning as the eye passed by. 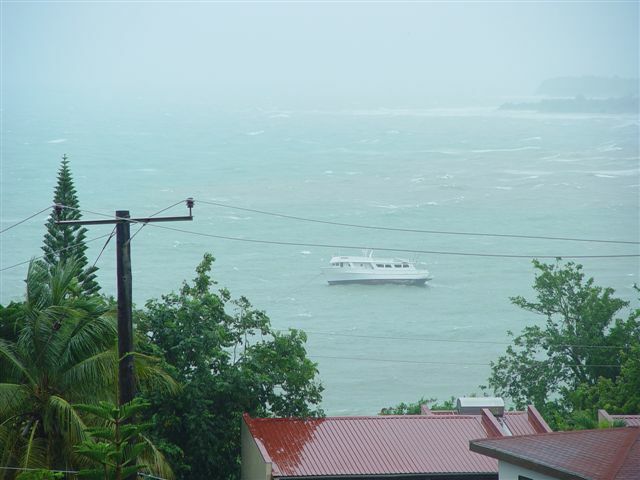 Gusts up to 77kts or about 90mph and 101.7mm of rain were officially recorded at the George F. L. Charles Airport in Castries. 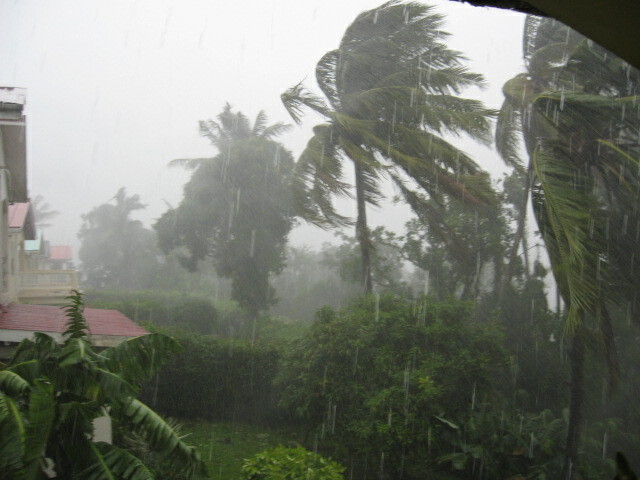 Even stronger winds have occurred in the Gros Islet area which is the northern most district of the island. The situation there is very grim based on the reports I have received. 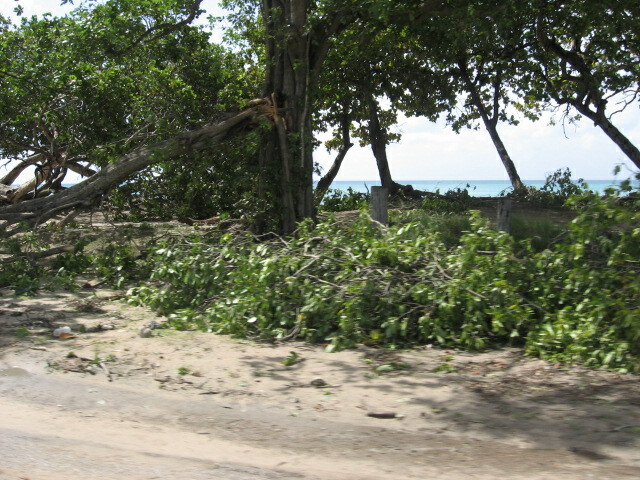 The famous Rodney Bay tourist area has been heavily damaged with many roofs damaged and a lot of trees and power lines down. Power has not been restored there as yet so it could be a long night for persons living in the area not to mention the tourists. 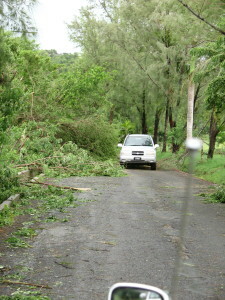 Cap Estate, located at the very northern tip of the country was probably brushed by the eye and the eyewall as a brief calm period was reported by one of our correspondents. 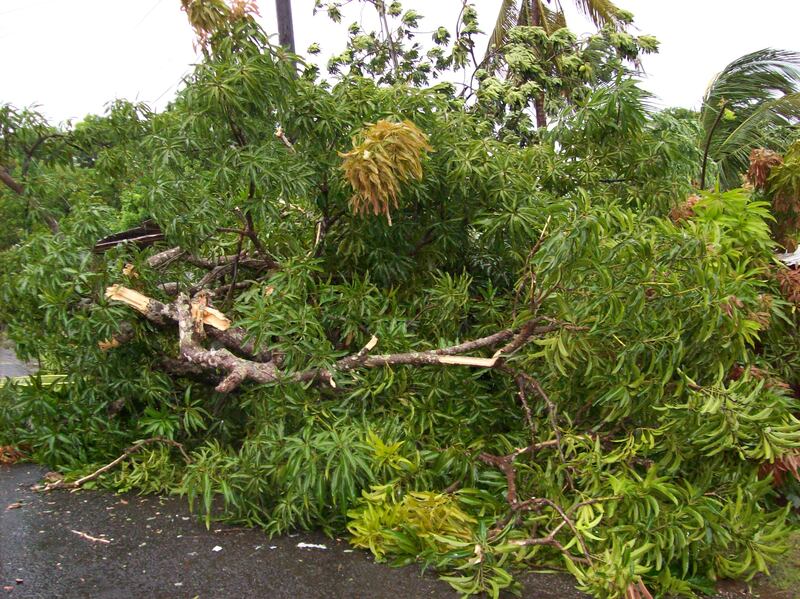 Generally, St. Lucia was heavily impacted. 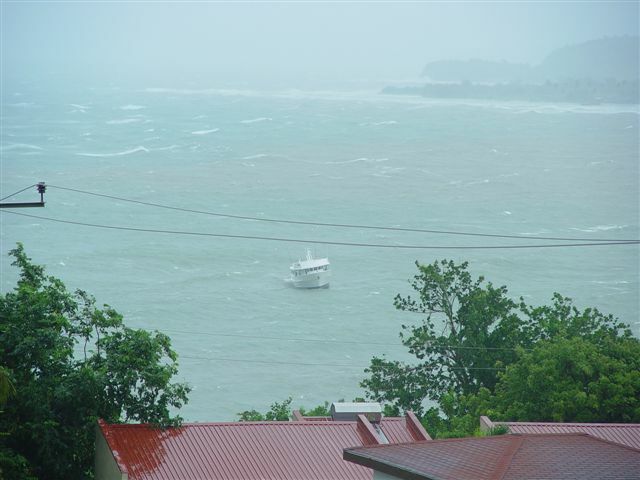 I have never witnessed such violent conditions on St. Lucian soil before but it could have been worse had the eye passed about 20 or 30 miles further south. Martinique was worse hit than us so I am keeping my fingers crossed for our neighbours over there and I hope to hear from them soon. 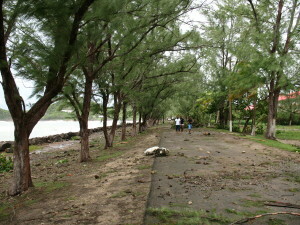 I will post some pictures taken during and after the hurricane a little later. Well at around 5 am things calmed right down and we were beginning to think that was the end of Dean, no such luck!! 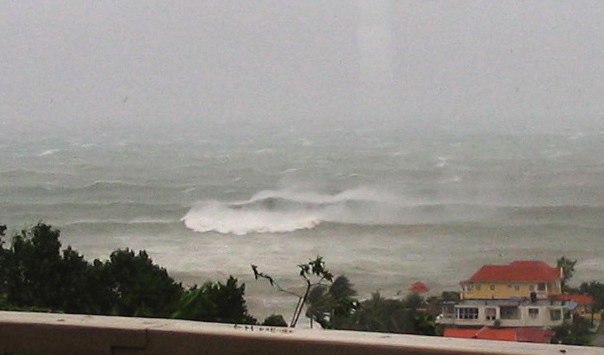 About half an hour later the wind backed right around and started blowing harder than it had all night. The wind pressure was incredible and unfortunately what was once a protected back porch turned into a open funnel for the wind and rain to drive through. I would guess that the wind was at least 60 to 70 knots. Several trees that survived the first onslaught started to loose many branches and what little greenery was left seems to have been shreaded and ended up plasted on my house. 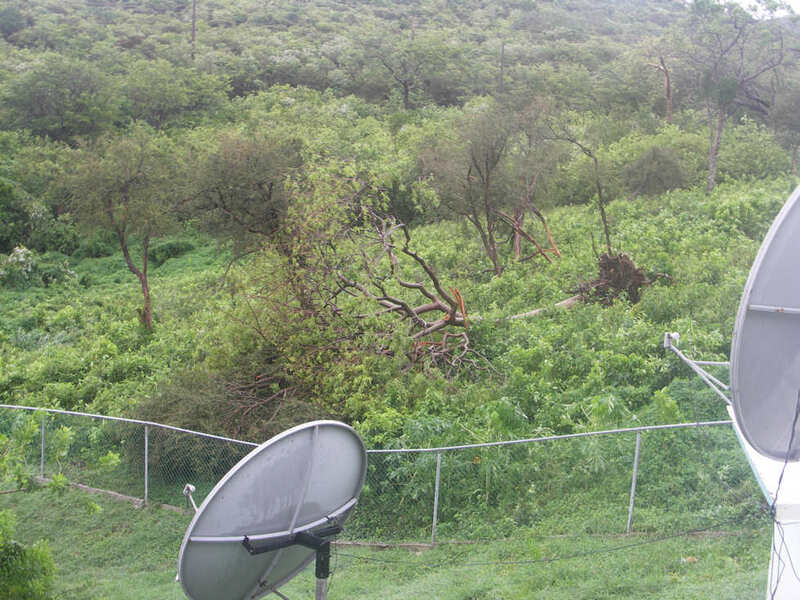 I have an 8' satellite dish in the back yard that started to shake itself loose but fortunately the wind has eased off and hopefully it will standup to the rest of what Dean can through at us. There is talk that a curfew is in place, I have a brother living on a ridge near me that I have not heard from. I will run up the road and see why he is not answering his phone. Well, at the officer as there's no power at the house as is for most of the island. 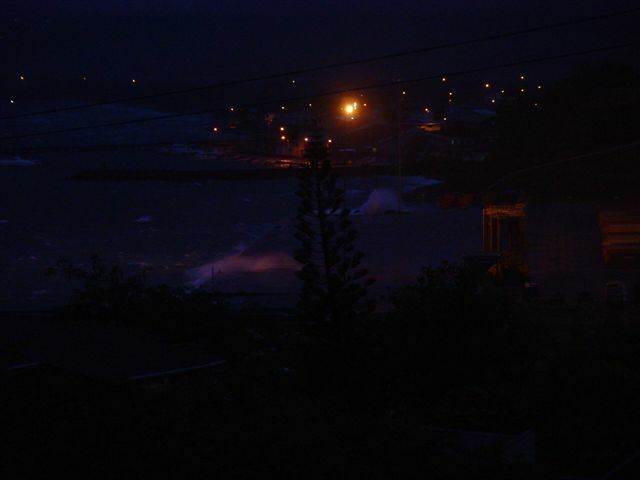 Most of the night saw occasional strong gusts and rains until about 4 or 5 am when it got really busy. From my safest room I could hear the crackling of trees, flying debris and the strain of structures under the high wind gusts. A mandatory curfue was issued at about midnight. Ventured out when the winds somewhat subsided about 9am to assist couple friends one of which her house got blown away and the other whose roof folded over. 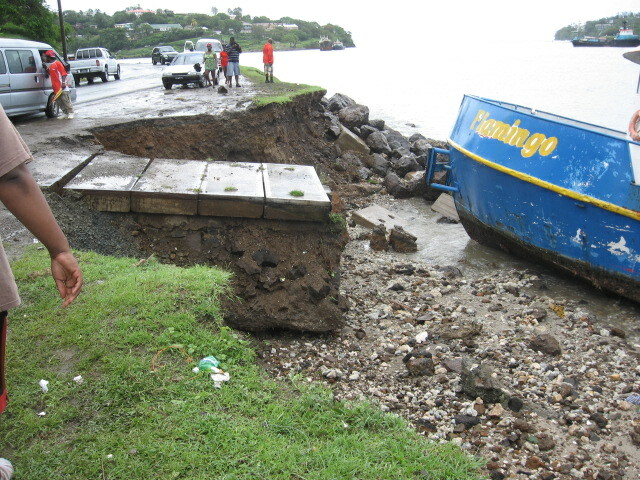 The sea had apparently come ashore into Castries and deposited huge boulders, sea debris and a boat onto the roads. Power lines and broken trees lay fallen all along the route. There was a radio announcement thet the roof being blown off the children's ward at the Victoria Hospital. 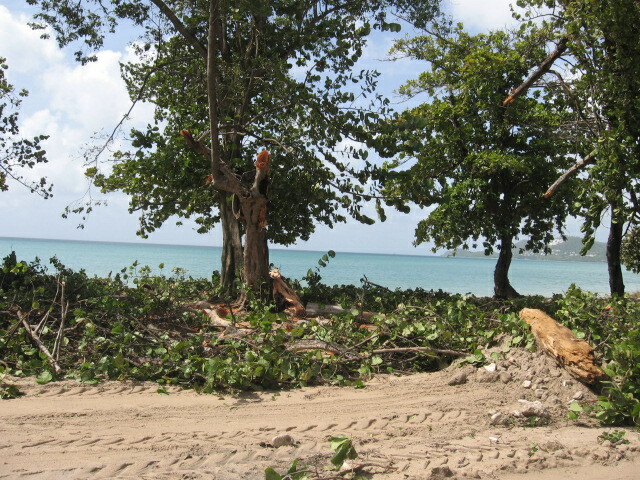 There is sand, trees and sea debris all up to the airport fence at Vigie. The surf is still rather higher than normal. Those who are in the path of this storm need to take it seriously and prepare yourselves. I'm located in Cap Estate which is in the very North of the Island and at around 3 am the winds started blowing strongly from I would guess the West. It's now 4.45 am and the wind has been backing around to the East and blowing a real gale. 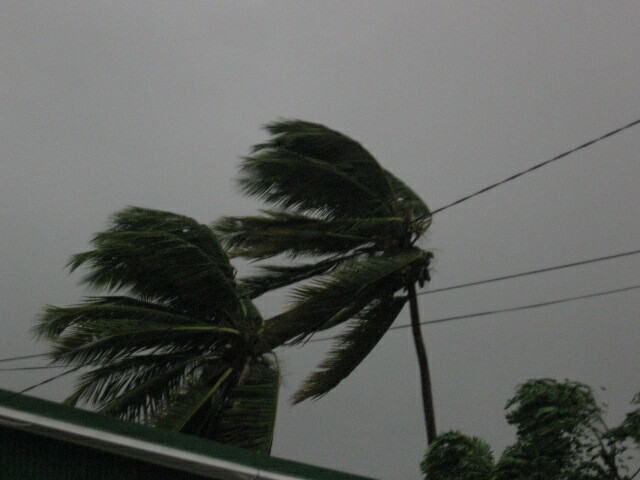 I'm partly sheltered so its very difficult to tell how strong the winds are. I have a tree down in my yard and the power has been off for a couple of hours, I'm on my standbye generator and hopefully my phone line will stay up. 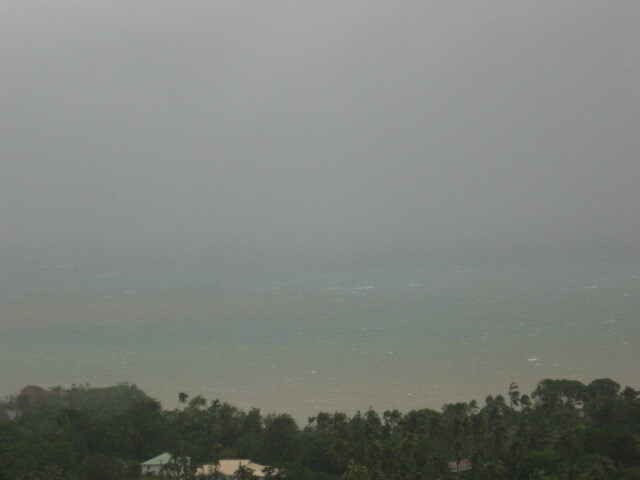 It appears that the eye of Dean will pass very close to the north end of the island and this is something we were not expecting and so the conditions are I feel much worse. There must be many people that have been caught unawares as to the severity of the storm, hopefully they will get through this without much material damage but I think not. I was here for Allen and this is very similar in experience so far. Well I have to take a walk around as sitting still in my nervous state is doing me no good. Hopefully I will be able to report back in a couple of hours. As Mike said the initial band hit us like a brick. blowing in rain and banging shutters. The kids and I scrambled to lock the shutters ( I drilled all the holes for the towel bolts this morning and after that initial passage its dead calm outside. 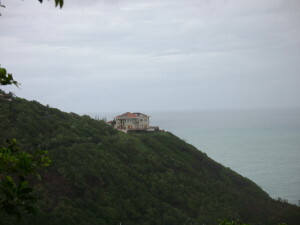 We only opened one shelter and that was in central Castries for the homeless people. At the mid day pre-strike meeting with the Acting Prime Minister Stevenson King, the PM asked what was the plans for the homeless and charged the Ministry of Social Transformation to be responsible for their safety. This was the first time in all the meetings I have ever been at where the a PM showed concern for the homeless during a hurricane. As most of my work is with this population (drug use and HIV, psychiatric co-morbidly) I was Very impressed. Mr Ferdinand from the Ministry and I walked around spreading the word that the town hall would be open to shelter and got some bread just in case we could not get any other food at such late notice. 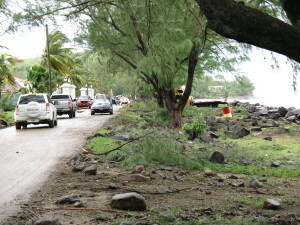 Luckily one of the local hotels Almond Morgan Bay donated sandwiches and soft drinks for 100 persons. which was also very generous in light of them having to feed all their guests and their staff and their staff families who they took into the property. we just came from the shelter, the police are assisting and it was wonderful and sweet to see a city constable pouring juice for the homeless men. A police van is driving around announcing the shelter and giving rides. It was policing at its best. 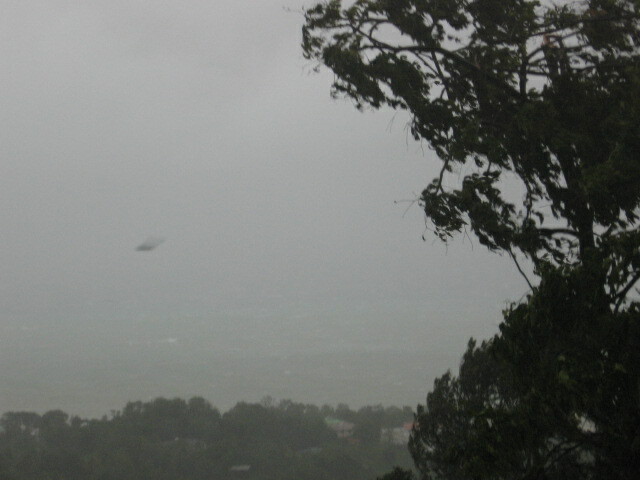 The leading edge of Dean pass over St. Lucia about 6pm this evening with a sudden increase in the winds with sustained winds of 44mph with gusts up to 58mph accompanied by heavy rain and thunderstorms. However, this activity was very brief and lasted for less than an hour. Since then, the weather as been surprisingly calm with a few showers but very little wind. I am expecting the conditions to go downhill very quickly once the core of the hurricane approaches in the next 3 - 6 hours. Please pray for us and our neighbours to the north who might get hit even worse. Well lets see what dean has in store for us..
the duration only emergency antenna is up. Well it's started up again...RAIN RAIN RAIN...no winds yet though..a few lightening flashes now and then.. Since 5:30pm (or thereabouts), we've had some rain, a bit more wind. Rumblings of thunder and sheet lightening have dominated the night sky. 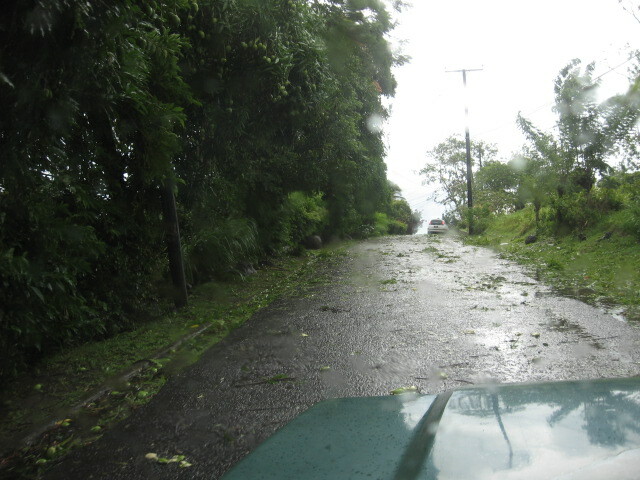 Driving towards Soufriere (west coastline), I noticed a few branches have come loose and dropped onto the road. Everything is still calm, the crickets and frogs are still churping to their little hearts content. 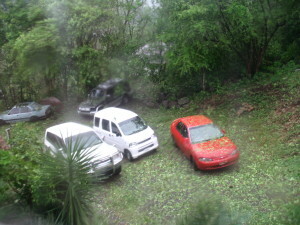 It got suddenly dark about an hour ago and then came some major rain and probably 40 - 50 mph gusts for about 20 minutes. 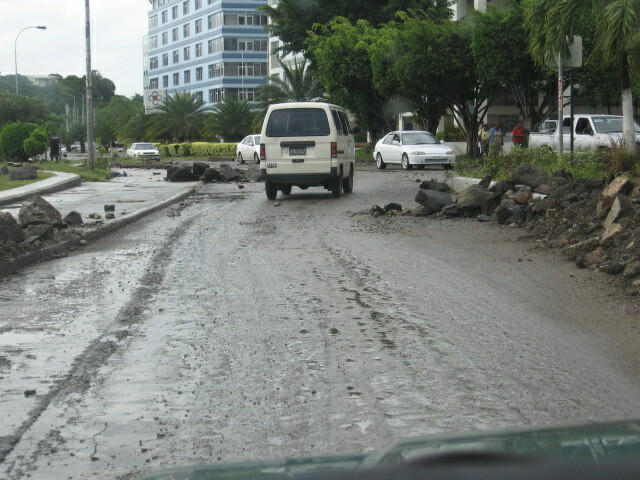 Driving from the office there are already downed trees and debris along the way. It hasn't stopped raining but the winds have died for now. Lightening accompanied with thunder started about 20 minutes ago. Will keep posting as long as there's elec. and internet service. on Hurricane Dean through the weekend. Feel free to contact me if there is anything I can do. Yes it's about that time when we know there is no full escape, even if Dean turns northward the threat of flooding still remains. All preparations should be rushed to completion. As Mike Davis has rightly noted below St. Lucians may not be ready for a system at this time as we have become pretty complacent not having a serious weather system seriously affect us since 1995 and before that 1980. Good thing about Dean is that its travelling very quickly and hopefully will continue that way was as it passes through. Off to the disater preparedness meeting. 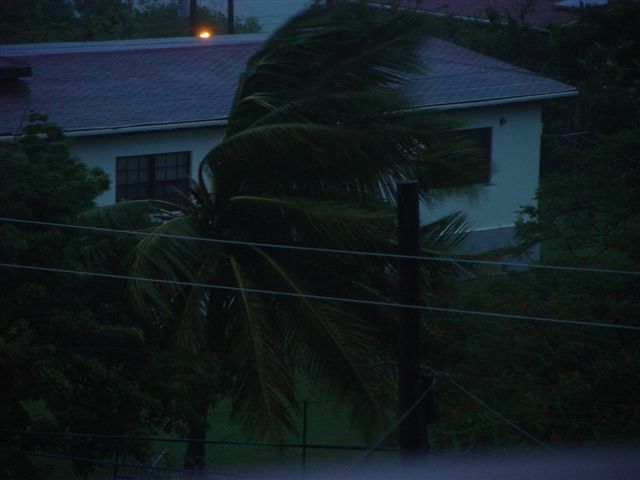 A hurricane warning has been issued for St. Lucia at 5am this morning. This is the 1st time since Hurricane Marilyn in 1995 that the risk of a hurricane strike is as high as it is today. That system missed us and struck Martinique and Dominica. So how lucky will we be this time around? 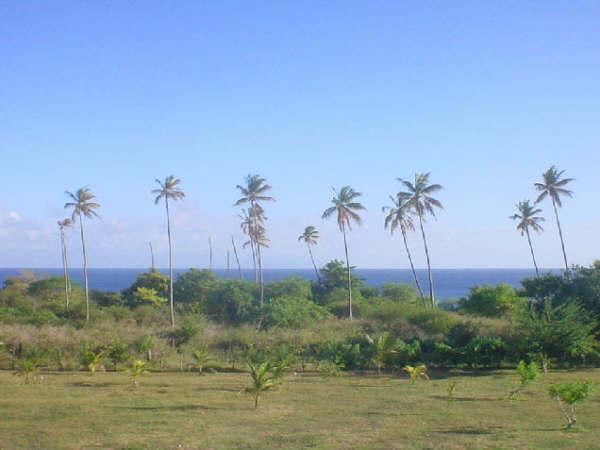 The island hasn't been struck by the hurricane since Allen in 1980 and we haven't had a major disaster since Tropical Storm Debby in 1994 therefore, it is not easy to get persons mobilised in times like this. I honestly believe that St. Lucia as a nation is not ready for a system of that magnitude at this time. - Be on the lookout!!! DEAN.... Monitoring for another 12 hours and then calling the old disaster preparedness meeting in the morning. Everyone from Grenada all the way up to Guadeloupe should be keeping a close eye on this guy.. The weather has been pretty indecisive over the past few days. Much better than the 95 degree days I endured for 3 weeks in NYC though. I woke up this morning at just gone 6AM to the sound of rain falling. It's a steady consistant downpour, it's also still quite dark as though the sun has gone into temporary hiding. It's also the first time at this time of the year that i'm feeling cold. I'm sat here in a sweattop and long sweatpants :) According to wunderground (http://www.wunderground.com/global/stations/78948.html) it's supposed to be 86F today !! 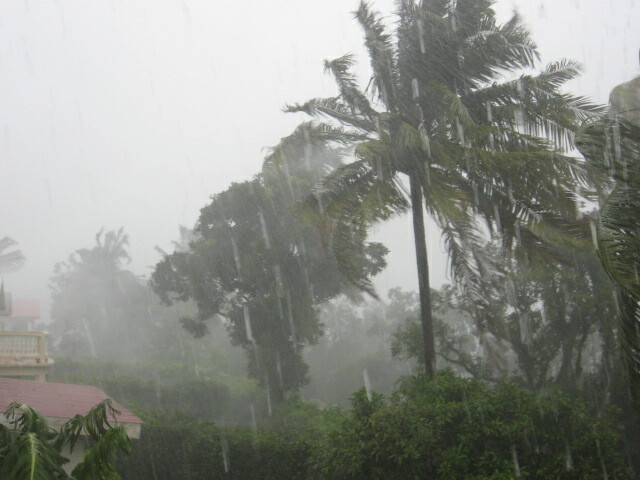 As the tropical wave moved through Saint Lucia this afternoon, it gave us an impressive sound and light show that sent the children scattering and hollering, so unaccustomed to thunder and lighting. Its cool this evening and the air is light and fresh a welcome respite from the past few days where the air has been thick and moist. I realised that I needed to finish putting the towel bolts on the window shutters and drill the holes to secure them before a real wind storm hits. Of course instead of working I spent the morning on the beach with children and friends enjoying the emancipation day holiday. We've had a bit more rain over the past couple of days - I got soaked yesterday morning after walking the dog!. It's been raining continually today and it seems darker than normal - its not been a heavy rain, but a faint quiet rain - for a moment or so I had to look closely out the door to check that it was still raining.... :o) Had a few big rumblings of thunder just now and wondering whether that will continue and/or the rain will get heavier. Haven't seen any lightening as yet. 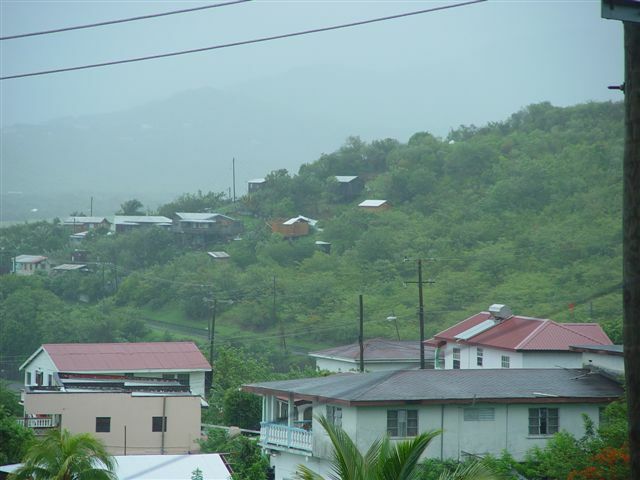 The last 9 days have been very dry in St. Lucia with only 24.3mm and 10.2mm of rainfall recorded at Hewanorra Intl. Airport and George F.L. Charles Airport respectively. 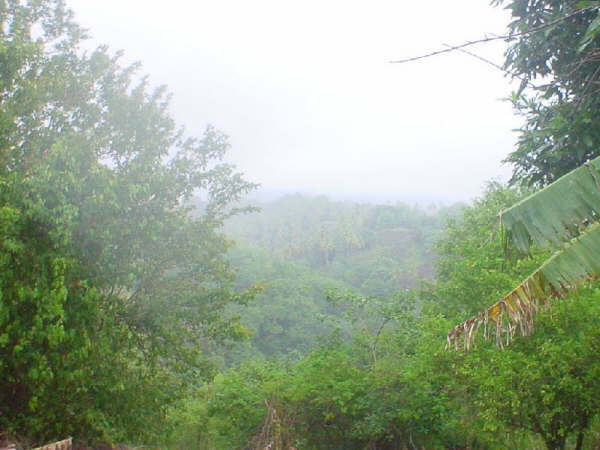 A tropical wave moved through the area yesterday and provided some relief because 16.1mm out of the 24.3mm at Hewanorra was measured in the last 24 hours. Nevertheless, drought-like weather conditions are better than tropical storm or hurricane conditions so I can live with it. from around 9 am till about 2 pm. All the tanks are full again, hurray. Let us see what this season has in store for us, pray and knock on wood eh. Sunny start, rainy day.. 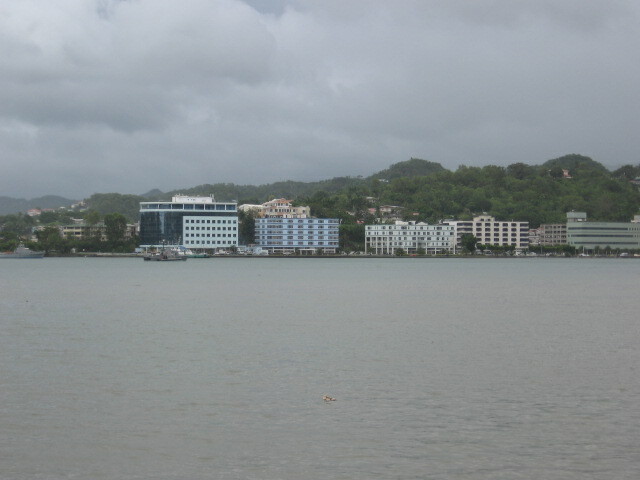 Very overcast and wet here in Castries, saw some minor flooding in the city center during the morning, even heard some thunder. Its been scorching hot for the past 2 weeks so the wet weather is very welcomed by most I would imagine. It's been a hot, hot day here today. Took my puppy down to the local bay for a quick dip in the river (which he didn't like! ), but at least it tired him out for a few hours. There's been a few short showers this evening, and they haven't cooled down the heat one bit. It's very humid, no breeze to speak of so its very still that even the trees are hardly moving. We had a nice shower of light rain this morning. Luckily it abated while I took the dog for a walk, albeit it did stop me from taking him down to the local beach. Then the rain started again, but, only for a little while. Since this morning, it's been very hot and humid, with a slight breeze. At least there are a few more clouds in the sky! 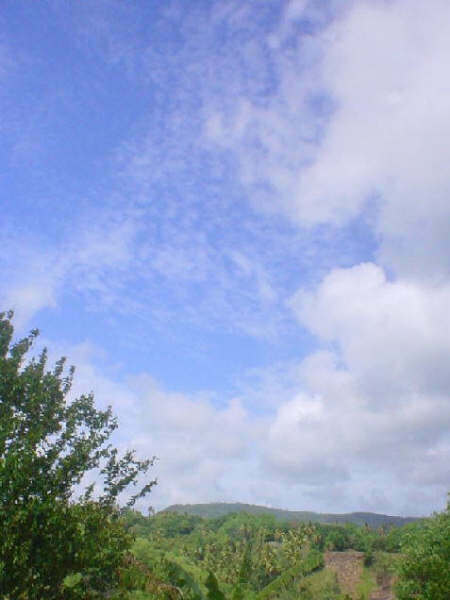 Apart from a rain shower last night, there's been hardly any clouds in the gorgeous blue sky over the past few days. The grass is dry as anything, It's as dusty as anything (I really need to clean my jeep!) and the leaves from the sour orange and lemon trees keep blowing into my house. 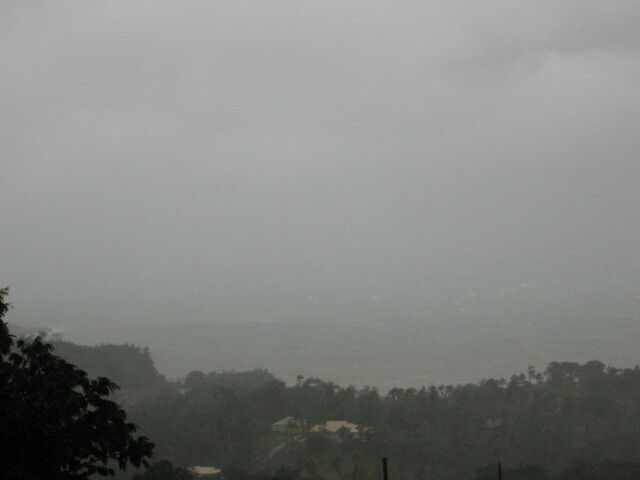 The pic below is looking out towards St Vincent. Even though it's clear, you can't see St Vincent at all.